You going to see Guardians of the Galaxy this weekend? 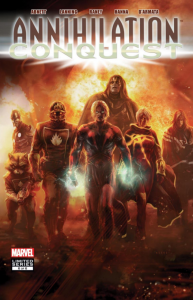 Or maybe you want to wait until you read up on this crazy bunch of cosmic superheroes before going to the theater? Either way, be sure to check out my latest list at ComicBook.com which looks at 10 essential Guardians of the Galaxy comic book reads. Consider this list your primer for one of the most anticipated movies ever!